The Original MakeUp Eraser! Never buy another disposable makeup wipe again. Save money and keep harsh chemicals away from your skin by removing your makeup with the reusable MakeUp Eraser. 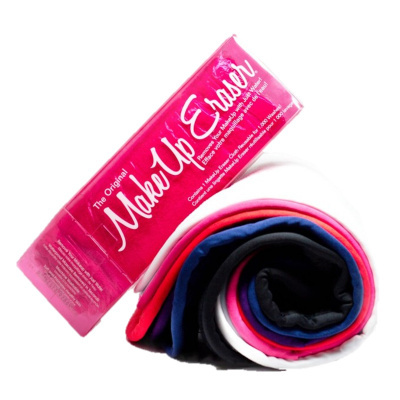 The MakeUp Eraser is an ultra-soft, proprietary blend of polyester, anti-bacterial cloth that with WATER ONLY removes 100% of your makeup. It removes all waterproof, smear-proof mascara and makeup, including liquid eyeliner, blush, base, stage makeup, and even face paint. Just wet the cloth and remove your makeup. It’s like MAGIC! 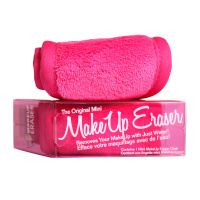 The MakeUp Eraser is machine-washable and is guaranteed to remain effective up to 1,000 washes. The magic is in the weave of the fabric. One side is designed to remove the makeup, while the other side offers a longer weave to exfoliate your skin too. 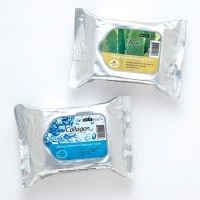 Your skin will be left with NO residue and feeling fresh and clean. Just one use and we know you'll be hooked! Makes a great gift too! The MakeUp Eraser is 15" long and 7" wide. Note that the Watermelon color also includes a makeup case, and the Hologram color also includes a head band and makeup case.